Have you noticed the different tempos and rhythms of life? The music of our lives seems to shift with the seasons. Sometimes the change is abrupt and unexpected. However, often it is predictable and anticipated. For many families, the month of August is a month when the beat changes. The slow and easy songs of summer give way to the more structured cadences and complex melodies of the school year. Even as the seasons change, there is an underlying theme that God intends to weave through the various movements in life’s symphony. 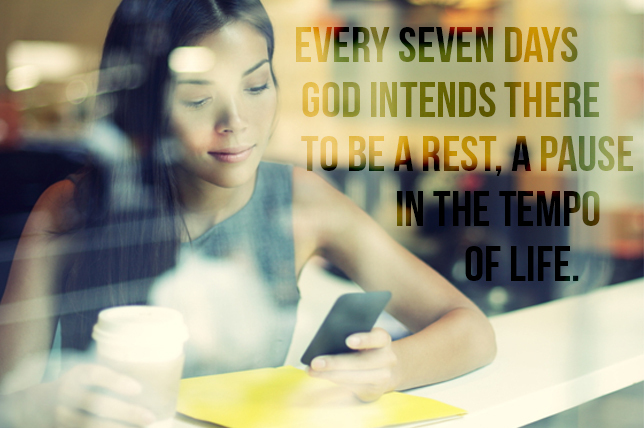 It’s a theme expressed in the creation pattern of six days of work and then a day of rest. Every seven days God intends there to be a rest, a pause in the tempo of life. When this weekly pattern is in place, it reminds us to reconnect with God and his purposes for our lives. It encourages us to listen for his word and care for our souls. It calls us to participate in a community of worship and service. It challenges us to live beyond ourselves and for the glory of God. By Jesus’ day this beautiful weekly tempo of worship and rest had been corrupted. Some had made it a burden rather than a blessing. That’s why Jesus taught us the meaning of this creation song again: “the Sabbath was made for man, not man for the Sabbath” (Mark 2:27). So, as we move into the rhythms of the school year, remember to embrace the life-enriching, God-honoring pattern of weekly worship with the body of Christ. It’s more than a duty or responsibility; it’s an opportunity to build into our lives a tempo, a pattern, a song that will satisfy our soul! If you have not yet made a commitment to membership at Ingleside, I hope to see you in the membership class this Sunday, August 17, at 4:00 p.m. No reservation is necessary. Dress is casual and a meal is provided. Take the next step this Sunday!